Brunei is located on the north coast of the island of Borneo, facing the South China Sea and surrounded by East Malaysia. It gained independence from the UK in 1984. Its economy is heavily resource-dependent, with the oil and gas sector accounting for almost two-thirds of GDP. 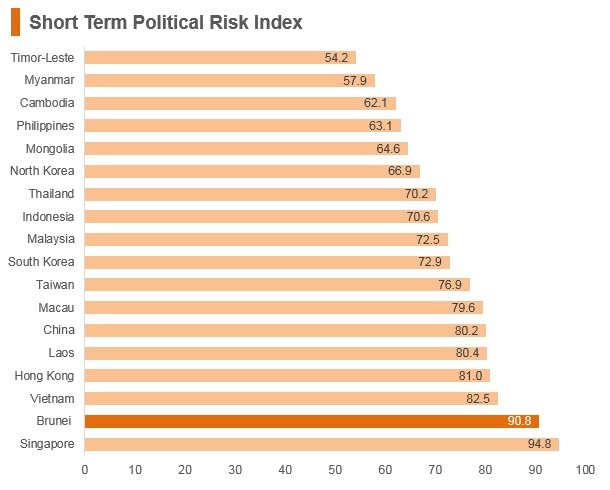 The country's large foreign reserve assets, low external debt and high import cover reduce overall risks, although a dip in oil-related revenues may place pressure on fiscal revenues. While the country is largely seen in the international community as a producer of oil and gas, it is currently undertaking a number of projects in a bid to further diversify its economy. 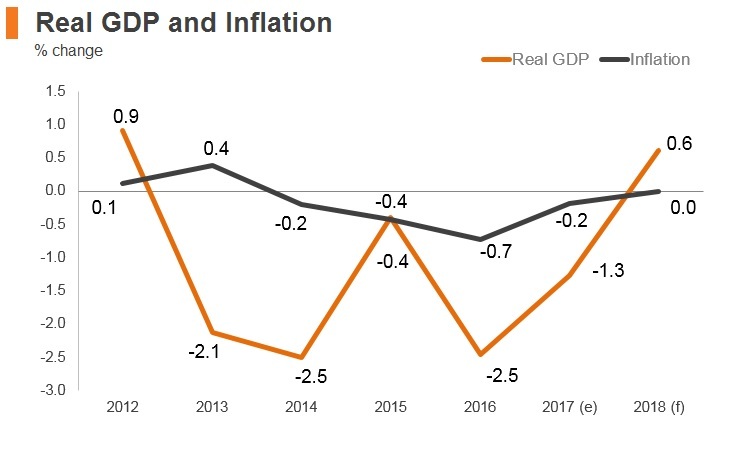 Furthermore, the high standard of living and wealthy population (per capita GDP) provide tailwinds to Brunei's long-term growth. 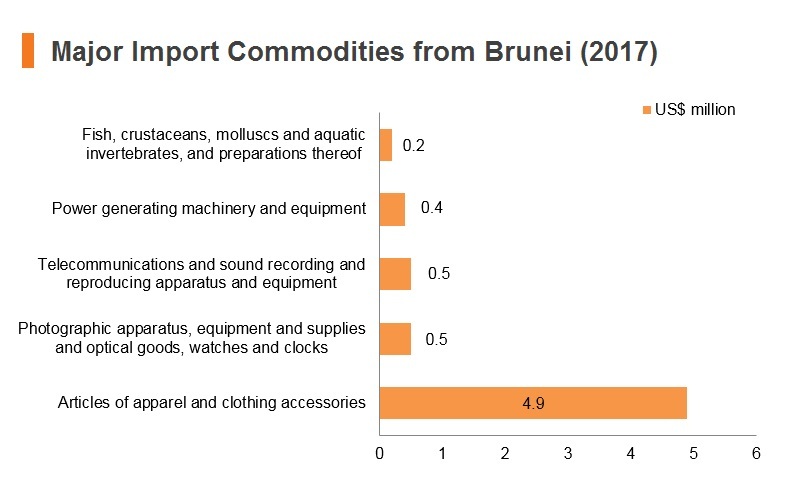 Brunei Darussalam joined the World Trade Organization (WTO) in January 1995 and has been a member of the General Agreement on Tariffs and Trade (GATT) since December 1993. The Customs Import Duty Order 2012 and Excise Duty Order 2012 were created to facilitate trade and to attract FDI. 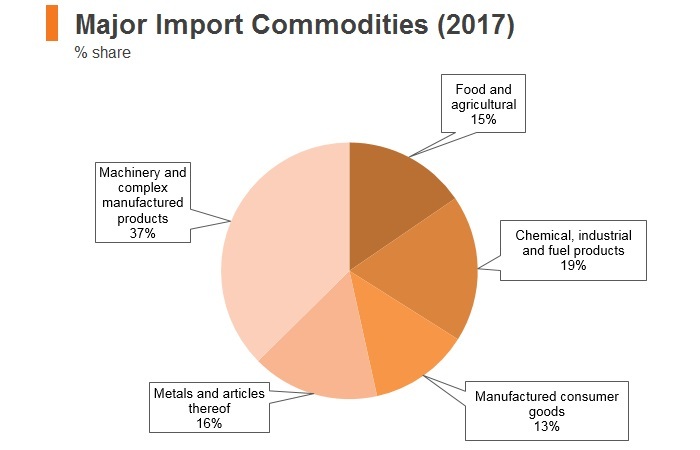 Basic foodstuffs and goods for numerous industrial uses are exempt from import duties. There is no tax on computers and peripherals. Excise duties are levied on certain goods, including cars at 20%, and 15% for heavy vehicles. Other consumer products, such as perfume, cosmetics, clothes, carpets, shoes, jewellery, office equipment, telephones, television sets, lamps and cameras are taxed at 5%. Import duties are also 5% for electronically operated industrial machines. 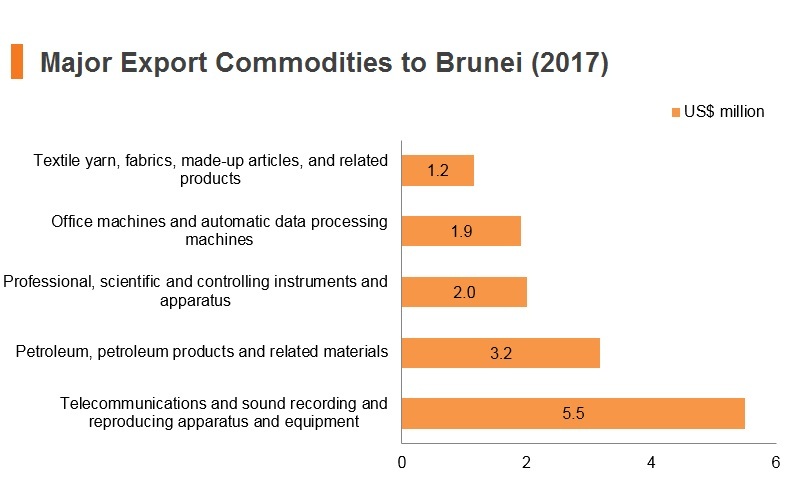 Brunei Darussalam views Free Trade Agreements (FTAs) as a vital part of its foreign trade policy. To date, Brunei Darussalam, through the Association of Southeast Asian Nations (ASEAN), has concluded FTAs with Australia, New Zealand, China, India, Japan and South Korea. Bilaterally, Brunei Darussalam has concluded an Economic Partnership Agreement with Japan (the Brunei-Japan Economic Partnership Agreement) and a plurilateral agreement with Chile, New Zealand and Singapore (the Trans Pacific Strategic Economic Partnership). As the signatories to the Trans-Pacific Strategic Economic Partnership Agreement (P4), Brunei is involved in the negotiations for the Comprehensive and Progressive Agreement for Trans-Pacific Partnership (CPTPP). Brunei is emphasising its halal food industry as one of its key industries in an effort to diversify its economy. The country is promoting its own halal food certification regime, one entirely different from other halal certification organisations, which requires Bruneian inspectors to travel to production facilities in the country of the food exporter, at the exporter’s expense, to inspect the food production process. The Association of Southeast Asian Nations (ASEAN): This was established on August 8, 1967 in Bangkok, Thailand, with the signing of the ASEAN Declaration (Bangkok Declaration) by the founding members of ASEAN, namely Indonesia, Malaysia, Philippines, Singapore and Thailand. Brunei Darussalam then joined on January 7, 1984. The ASEAN Vision 2020, adopted by the ASEAN Leaders on the 30th Anniversary of ASEAN, agreed on a shared vision of ASEAN to promote economic growth and regional stability. ASEAN members are Brunei Darussalam, Cambodia, Indonesia, Laos, Myanmar, Philippines, Singapore, Malaysia and Vietnam. ASEAN members have agreed to lower intra-regional trade tariffs through the Common Effective Preferential Tariff Scheme for the ASEAN Free Trade Area. The ASEAN-Australia-New Zealand Free Trade Agreement (AANZFTA): Signed on February 27, 2009, this was ASEAN's first FTA with two developed countries simultaneously, and the first ASEAN FTA done in a single undertaking. AANZFTA represents ASEAN's most ambitious FTA to date, covering 18 chapters, including new areas that ASEAN had previously never negotiated on, such as competition policy and intellectual property. The AANZFTA also includes an AANZFTA Economic Cooperation Support Programme, which will provide technical assistance and capacity building to the Parties of the AANZFTA, with the aim of supporting the implementation of the Agreement, and the overall regional economic integration process. As of 2012, the Agreement has entered into force for all Parties and work is currently underway to resolve and implement the built-in agenda as stipulated under the Agreement. The ASEAN-Japan Comprehensive Economic Partnership: The Framework for Comprehensive Economic Partnership between ASEAN and Japan was signed by leaders at the ASEAN-Japan Summit on October 8, 2003 and was aimed at establishing a Comprehensive Economic Partnership agreement between ASEAN and Japan. The Agreement on Comprehensive Economic Partnership among Member States of the Association of Southeast Asian Nations (AJCEP) and Japan was concluded in November 2007 and signing was completed ad-referendum by April 14, 2008. The AJCEP is comprehensive in scope, with chapters on Trade in Goods; Sanitary and Phytosanitary Measures; Standards, Technical Regulations and Conformity Assessment Procedures; Investment; Services; and Economic Cooperation. The agreement aims at liberalising and facilitating trade in goods between ASEAN and Japan and promoting cooperation in fields such as Information and Communications Technology, Intellectual Property and SMEs development. The parties will also continue to discuss and negotiate improvements to the chapters on Trade in Services and Investment. Brunei submitted its notification on the completion of domestic procedures for the AJCEP on November 29, 2008, and the agreement entered into force for Brunei on January 1, 2009. The ASEAN-Republic of Korea Free Trade Agreement: ASEAN and the Republic of Korea consolidated their partnership by signing the Framework Agreement on Comprehensive Economic Cooperation at the ninth ASEAN-Republic of Korea Summit on December 13, 2005, which, among others, provides for the establishment of the ASEAN-Republic of Korea Free Trade Area (AK-FTA). Under this Framework, three major agreements on Trade in Goods, Trade in Services and Investment were subsequently signed on August 24, 2006, November 20, 2007 and June 2, 2009 respectively. The Agreement provides for progressive reduction and elimination of tariffs by each country on almost all products. 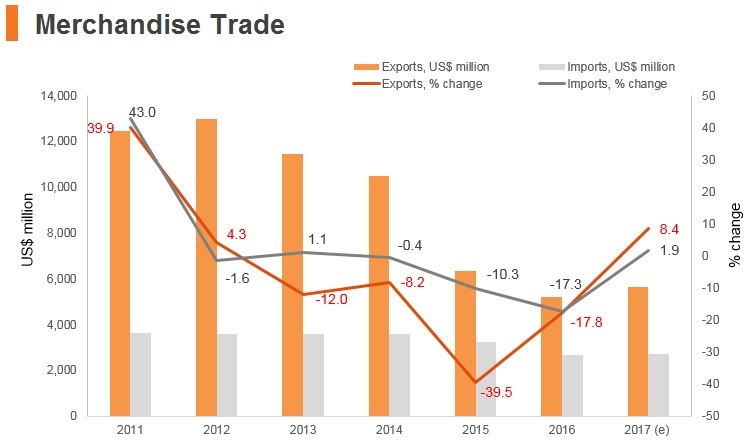 Under the Trade in Goods agreement, ASEAN-6 including Brunei Darussalam and Korea had eliminated more than 90% of tariffs by January 1, 2010. In efforts to further strengthen the bilateral trade relations, ASEAN and Korea agreed to look into further liberalisation of the sensitive products in the Sensitive Track of the ASEAN-Korea Trade in Goods agreement, pursuant to the decision of the Ministers at the 12th AEM-ROK Consultations in 2015. The ASEAN-India Free trade Agreement: The ASEAN-India Trade in Goods Agreement (TIG) was signed at the seventh ASEAN Economic Ministers (AEM)-India Consultations on August 13, 2009. The Agreement entered into force on January 1, 2010 for India and some ASEAN member states. For Brunei Darussalam, its date of implementation for the Trade in Goods Agreement was on June 1, 2010. The ASEAN-India Trade in Services and Investment Agreements were signed in November 2014. Both Agreements entered into force on July 1, 2015 for six ASEAN Member States, namely Brunei Darussalam, Malaysia, Myanmar, Singapore, Thailand and Vietnam, as well as for India, which have notified their ratification of the Agreements. The Framework Agreement on Comprehensive Economic Cooperation between ASEAN and China (ASEAN-China FTA): The Framework Agreement on Comprehensive Economic Cooperation between ASEAN and China that was signed on November 5, 2002 marked ASEAN's first FTA with a dialogue partner. The framework comprises three main agreements to date: Trade In Goods, Trade In Services and Investment, which were concluded in November 2004, January 2007 and August 2009 respectively. At the 16th ASEAN-China Summit on October 9, 2013 in Bandar Seri Begawan, Brunei Darussalam, the Leaders agreed to pursue the upgrading of the ASEAN-China FTA by, among others, improving market conditions and trade balance between both sides, as well as expanding the scope and coverage of the Framework Agreement on Comprehensive Economic Co-operation between ASEAN and China. The Brunei-Japan Economic Partnership Agreement (BJEPA): The BJEPA is Brunei Darussalam’s first bilateral free trade agreement. The BJEPA was signed on June 18, 2007 and entered into force on July 31, 2008. 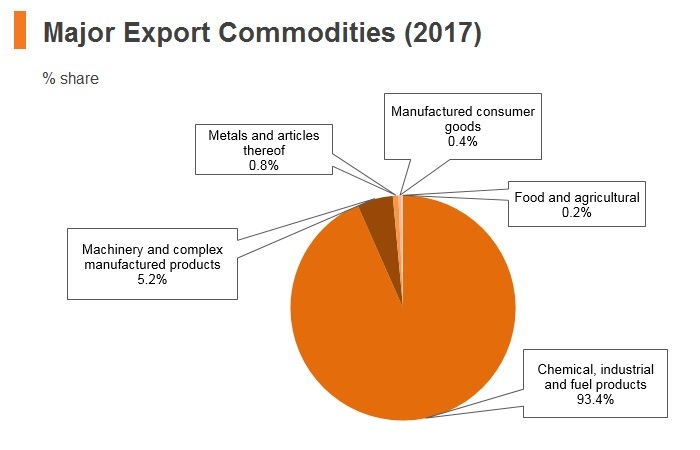 There are 11 chapters in the agreement covering Trade in Goods; Rules of Origin; Trade in Services; Investment, Energy, Cooperation; Improvement of Business Environment, Custom Procedures; General Provisions; Final Provisions; and Dispute Settlement. With the signing of the BJEPA, Brunei and Japan’s relations have moved on to a higher level, particularly in the economic sphere. The BJEPA is aimed at increasing new market opportunities for Brunei in Goods and Services and attracting more investment to Brunei. Market access between Brunei Darussalam and Japan will also be improved in terms of goods (through the reduction of import duties) and services. 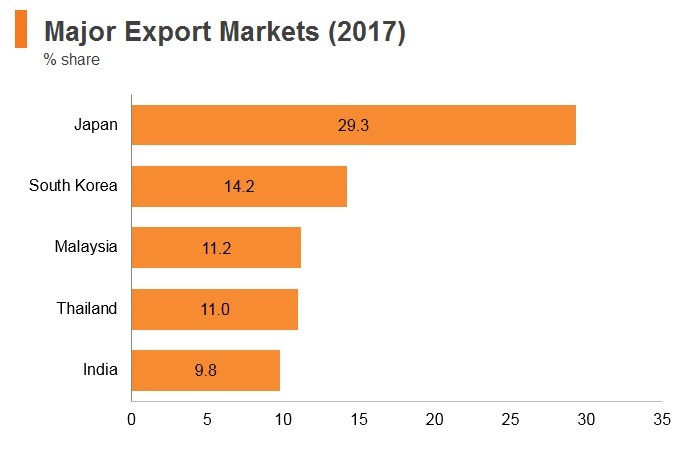 In 2016, Japan was Brunei's largest export partner, with Brunei exporting over a third of its total exports to Japan. The majority of the products were mineral fuels, mineral oils and products of their distillation and bituminous substances. Trans-Pacific Strategic Economic Partnership: The Trans-Pacific Strategic Economic Partnership Agreement (P4) is a Free Trade Agreement between Brunei Darussalam, Chile, Singapore and New Zealand signed on July 18, 2005, and entered into force on May 1, 2006. In 2009, after finalising its Services Schedule and Government Procurement List, Brunei completed its ratification process, and the Agreement fully entered into force for Brunei on July 22, 2009. The Agreement brings about strategic benefits for all four partners, Brunei Darussalam, Chile, New Zealand and Singapore, and in effect builds a bridge between Latin America, the Pacific and Asia. The Agreement can also help advance shared objectives in APEC and the WTO. The P4 also has side agreements, namely the Environment Cooperation Agreement and Labour Cooperation Memorandum of Understanding, to reflect a shared desire to encourage and promote sound labour and environment practices. These agreements establish mechanisms for ongoing cooperation and dialogue on labour and environment issues. ASEAN-Hong Kong Free Trade Agreement: The Agreement was signed in November 2017, three years after the negotiations commenced in 2014. 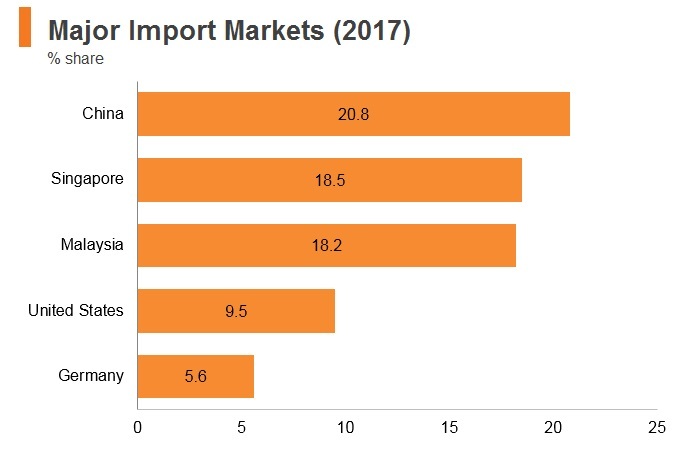 According to the Economic Ministers from ASEAN Member States, the ASEAN-Hong Kong Free Trade Agreement is the sixth such agreement between the ASEAN and external partners (China, Korea, Japan, India and Australia-New Zealand). The Comprehensive and Progressive Agreement for Trans-Pacific Partnership (CPTPP), also known as TPP11, is a signed trade agreement pending ratification by Australia, Brunei, Canada, Chile, Japan, Malaysia, Mexico, New Zealand, Peru, Singapore and Vietnam. Regional Comprehensive Economic Partnership (RCEP): RCEP is a Free Trade Agreement involving the ASEAN Member countries and their six ASEAN-FTA Partners (Australia, China, India, Japan, Republic of Korea and New Zealand). This entails a population of more than 3 billion people that contributes around a third of the world's GDP. The RCEP is envisioned to be a modern, comprehensive, high-quality and mutually beneficial economic partnership agreement that aims to advance economic cooperation, and broaden and deepen integration in the region, building on existing economic linkages. 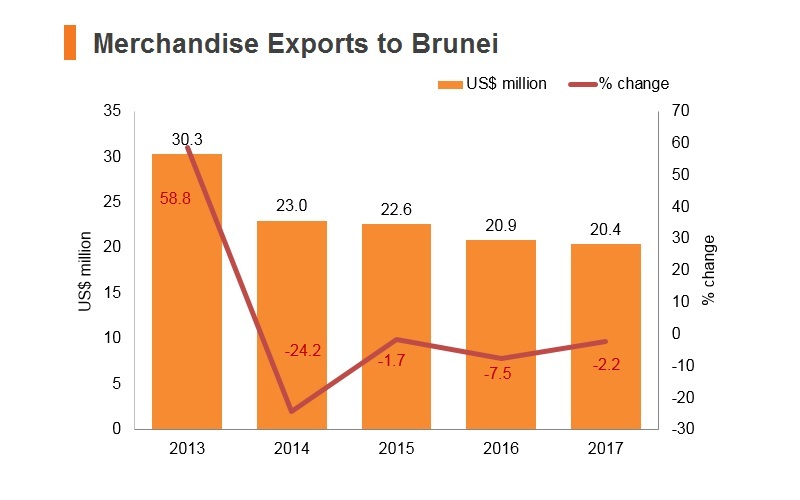 In 2014 Brunei released an Energy White Paper outlining its vision of leveraging its oil wealth to diversify its economy, create local employment, increase FDI, and sharply increase the use of renewable energy by 2035. Thus far, the government has shown that it is committed to the priorities outlined in the Energy White Paper. Brunei was named the most improved country in the World Bank’s 2018 Ease of Doing Business report for the third year in a row and this should bode well for future investment. 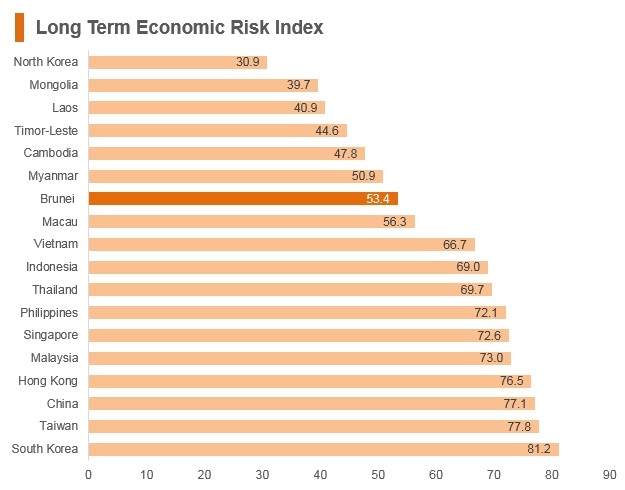 In terms of ranking, Brunei saw a 16-place jump from 72nd to 56th position, with 'getting credit' seeing a huge improvement from 62nd to second position globally, thus validating and giving form to Brunei's push to become an Islamic financing hub for the region. Brunei also has a currency interchangeability agreement with Singapore, which provides an anchor (and hence additional stability) for the Brunei dollar. Brunei amended its laws to make it easier and quicker for entrepreneurs and investors to establish businesses. The Business License Act (Amendment) of 2016 exempts several business activities (eateries, boarding and lodging houses or other places of public resort; street vendors and stalls; motor vehicle dealers; petrol stations including places for storing petrol and inflammable material; timber store and furniture factories; and retail shops and workshops) from needing to obtain a business license. The Miscellaneous License Act (Amendment) of 2015 reduces the wait times for new business registrants to start operations, with low-risk businesses such as eateries and shops able to start operations immediately. Muara Port is Brunei’s main seaport with an established Free Trade Zone called the Muara Export Zone (MEZ), which was established to promote and develop Brunei as a trade hub of the region. The establishment of the MEZ was an initial step towards developing other Free Trade Zones in the country. In Brunei’s 2017 Legislative Council session, the government announced that a 96 hectare area near Muara Port will be designated a Free Trade Zone. MEZ Muara Port is Brunei’s main seaport with an established Free Trade Zone called the MEZ, which was established to promote and develop Brunei as a trade hub of the region. The Goods and Services Tax (GST) will be set at 0% from June 1, 2018, according to the Finance Ministry. The Ministry said that the reduction of the rate from the current 6% to 0% will be implemented nationwide until a further announcement is made. This decision does not include goods and services listed in the Goods and Services Tax (Exempt Supply) Order 2014, which remain exempted. Brunei seeks to increase the number of Bruneians working in the private sector. 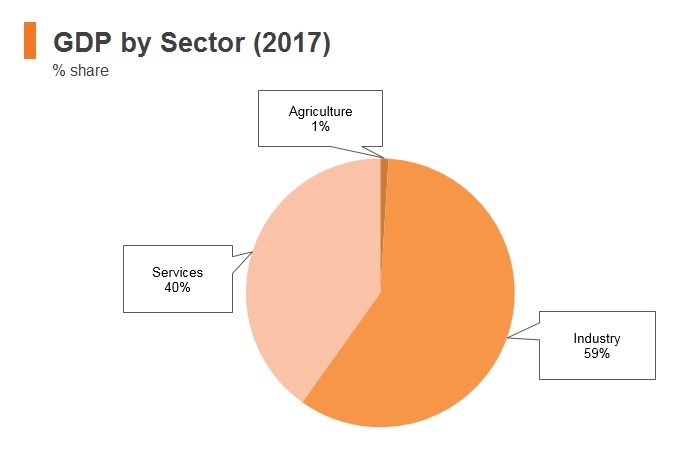 Brunei’s 2014 Energy White Paper calls for the number of people employed in the energy sector to increase from 20,000 in 2010 to 50,000 in 2035, and for the number of locals employed in the sector to increase from 10,000 to 40,000 during the same period. To advance this goal, all companies competing for a tender in the oil & gas industry are required to have at least half of their employees be Bruneian. Expatriate employment is controlled by a labour quota system administered by the Labour Department and the issuance of employment passes by the Immigration Department. Brunei allows new companies to apply for special approval to expedite the recruitment of expatriate workers in select positions. 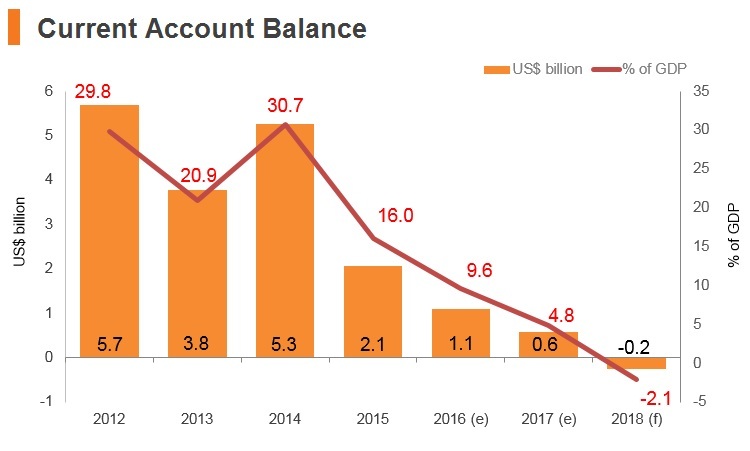 The economic recovery is expected to firm up in 2019, supported by stronger overseas orders and the government’s diversification plans. Nevertheless, the economy remains vulnerable to fluctuations in commodity prices. 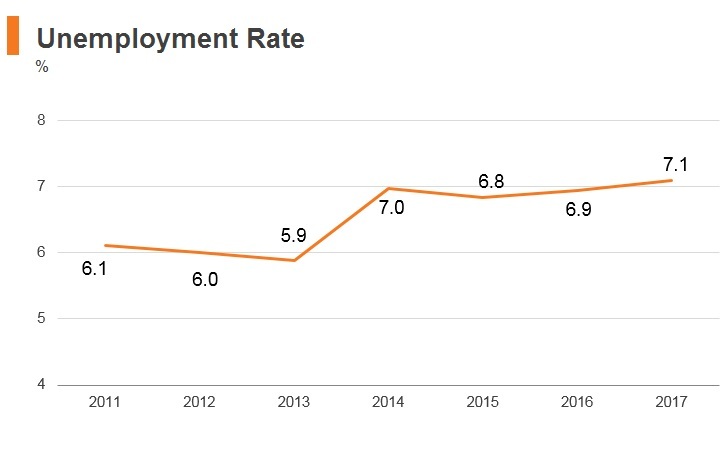 Economic momentum remained positive in the second quarter of 2018, buoyed by strong growth in the oil sector, which is benefiting from higher oil prices and robust global demand. Oil exports picked up and liquefied natural gas (LNG) exports recovered on strong demand from Japan, Brunei’s largest LNG export recipient. 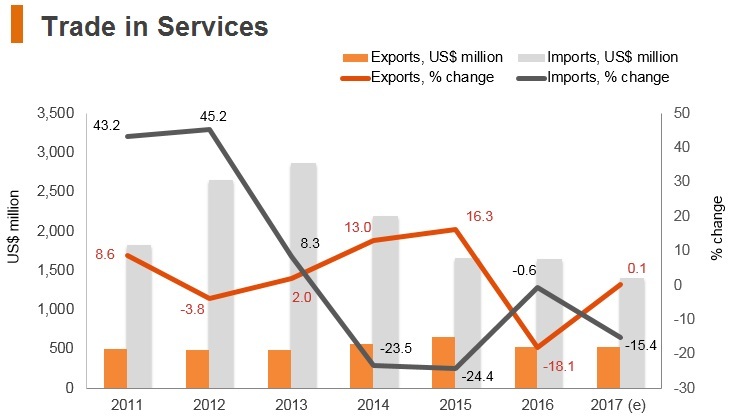 Imports surged over 40% in May 2018 on robust machinery and transport equipment imports, suggesting that fixed investment also strengthened. 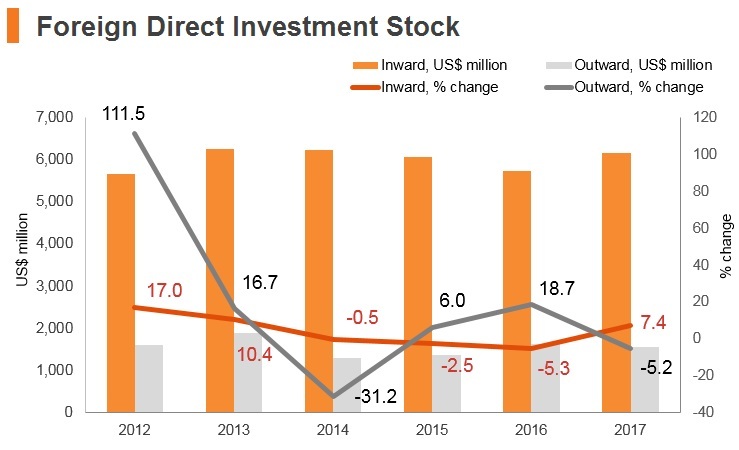 Although the manufacturing sector will likely continue to struggle to take off, the improvement in the business environment should aid the sultanate's plan to diversify the economy away from oil and gas into banking and financial services. 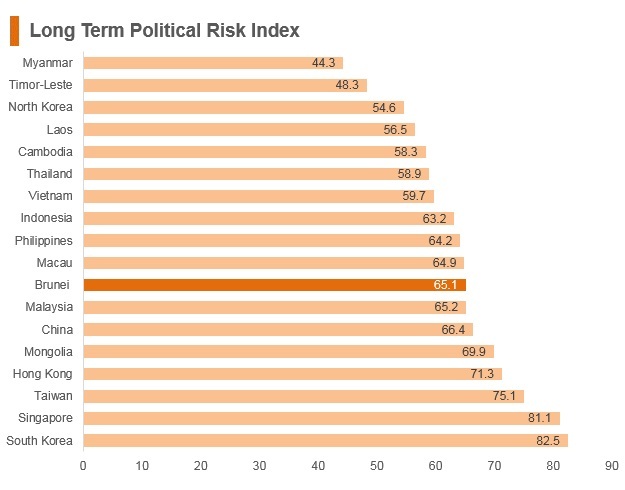 Furthermore, the high standards of living and wealthy population (per capita GDP) provide tailwinds to Brunei's long-term growth. 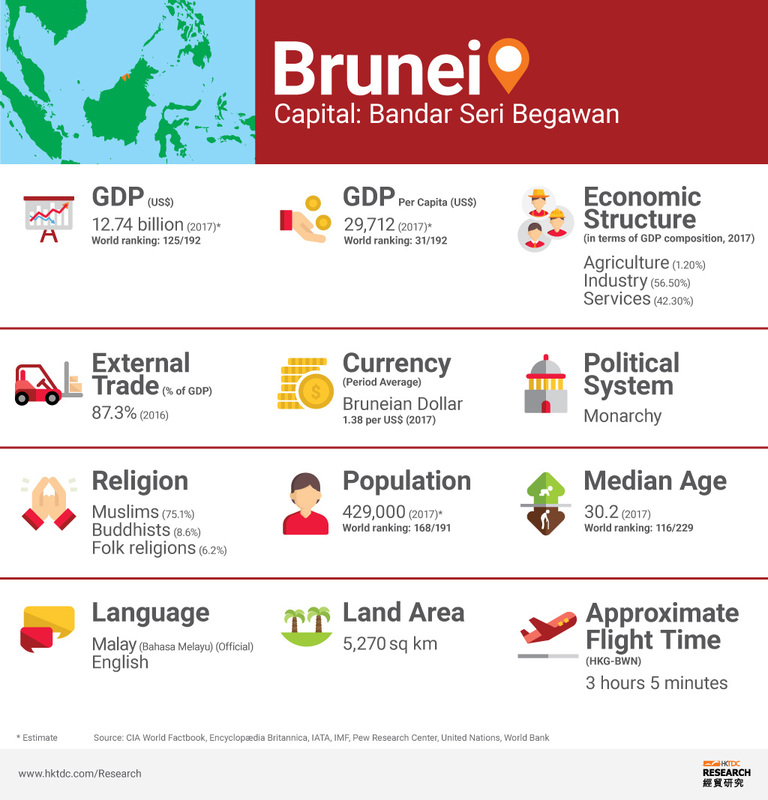 Energy-rich Brunei boasts a well-educated, largely English-speaking population, excellent infrastructure, and a government intent on attracting foreign investment and projects. 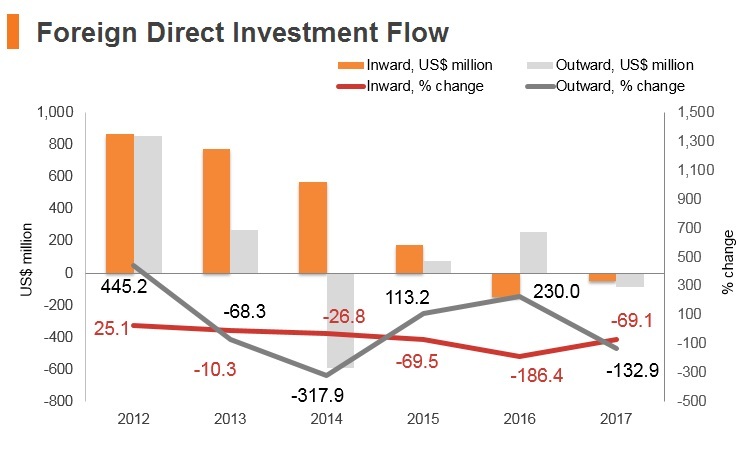 In parallel with Brunei’s efforts to attract foreign investment and create an open and transparent investment regime, the country has improved its protections for intellectual property rights. 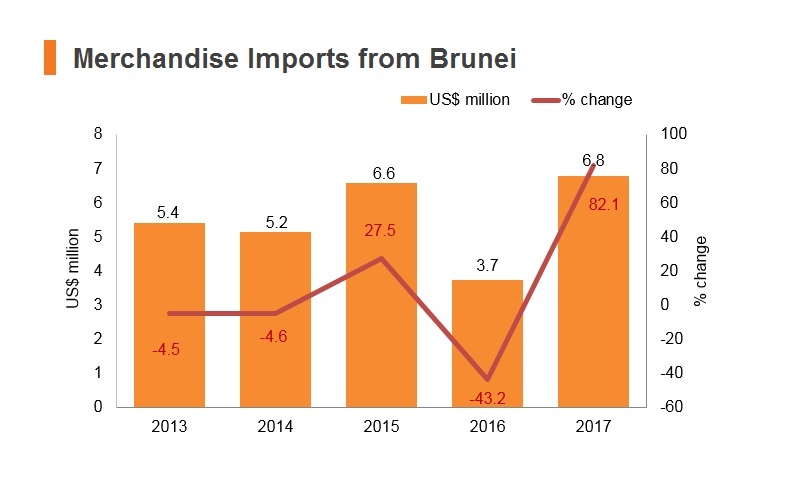 With a relatively free and open trading regime, as well as a small but highly educated workforce, Brunei Darussalam sees engagement on FTAs as an important step in ensuring that its people, goods, services and investments have continued access to wider markets around the world. 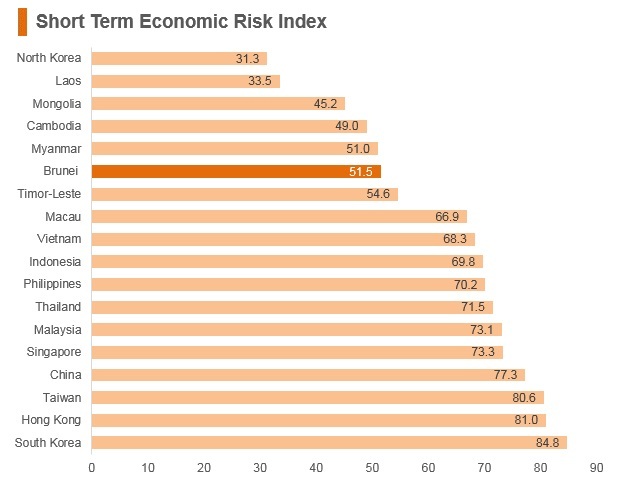 However, registering of property and trading across borders remain cumbersome, and coupled with an expensive and small labour force, Brunei’s operational risk environment has considerable further development to go if it is to catch up with its larger ASEAN peers. Brunei has a comprehensive double taxation agreement (DTA) with Hong Kong that entered into force in December 2010. HKSAR passport holders do not need a visa to travel to Brunei for a period of up to 14 days.